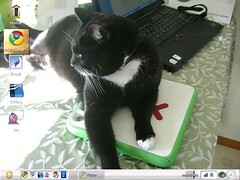 Lincoln the cat on Lincoln the XO laptop - a screenshot of the desktop on Lincoln the XO, which is running on an SD card. Lincoln is the last of my six classroom XO's to be set up in this way. I was unable to get a developer key for it (to load a different operating system), until the helpful volunteers at OLPC actually entered the serial number, etc. into the database - where it should have been all along. I was told this XO was produced on the second day of production in the first G1G1 run, back in 2007. Still tickin', and moving along faster than the good old days, too.